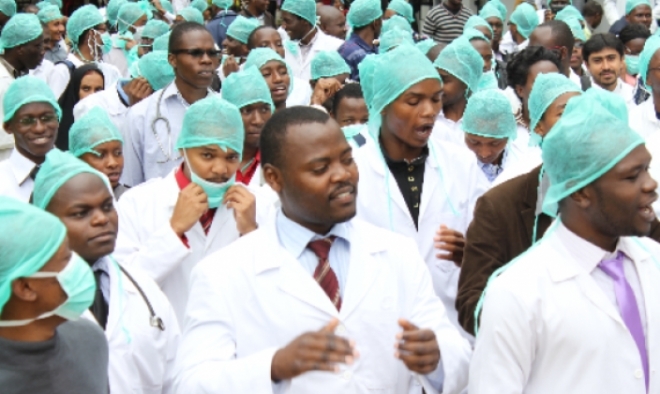 The momentary peace enjoyed in the country’s healthcare sector may be ruptured today, as the Joint Health Sector Unions (JOHESU) has directed members in all federal health institutions across the country to commence indefinite strike. The directive reportedly followed the Federal Government’s failure to implement an agreement signed with the unions on September 30, 2017. JOHESU comprises five health sector unions namely: Medical and Health Workers Unions of Nigeria (MHWUN); National Association of Nigeria Nurses and Midwives (NANNM); Senior Staff Association of Universities Teaching Hospitals, Research Institutes and Associated Institutions (SSAUTHRIAM); Nigeria Union of Allied Health Professionals (NUAHP) and Non Academic Staff Union of Educational and Associated Institutes (NASU). JOHESU also urged states and local government health institutions to be on standby, as they continued sensitisation and mobilisation of members to possible join the industrial action, in the event government delays in attending to its demands. JOHESU had suspended a nationwide action lasy year, after signing a Memorandum of Terms of Settlement slated, which was to be implemented within five weeks. National President of MHWUN and Chairman of JOHESU, Biobelemoye Josiah, who addressed newsmen in Abuja, yesterday, listed the issues as upward adjustment of CONHESS salary scale, arrears of skipping CONHESS 10, employment of additional health professionals, implementation of court judgment and upward review of retirement age from 60-65. “JOHESU, as a mature and responsible organisation, gave a 21-day notice on February 5, 2018, in the first instance, to enable government do the needful. “At the expiration of the 21-day notice, JOHESU leadership reconvened to reappraise the situation on ground and noted the lackadaisical attitude of the federal government towards the implementation of the Memorandum of Terms of Settlement signed on September 30, 2017. “In furtherance with our mantra as peace lovers, who have the interest of the masses at heart, another 30 working days ultimatum was issued to the federal government on March 5, 2018, to alert government of the impending nationwide strike.